This collection was designed to evoke all those cozy holiday feels. Images of horse drawn carriages and large antique sleighs dominated my thoughts as I visualized what I wanted to create for the 30 Days of Cozy. When I look at the Sleighride Wrap, I can’t help but picture a moonlit night gliding through the snow as I enjoy the holiday light displays. That image is what inspired the striped design found in each of these patterns. Something I have noticed is that there is a distinct lack of gender-neutral and masculine patterns, especially when it comes to pattern bundles. For this reason, I wanted to be sure to include a variation on the sleigh ride theme that my husband, and hopefully others who prefer a more traditionally masculine look, would enjoy. I consulted him on everything from colors to stitch tension, and the resulting Sleighride Scarf is everything I hoped for (as in, something he will actually use). My hope is that makers will find something in this collection that every member of their family might enjoy. So, grab a cup of something warm, pop on your favorite show or playlist, and settle in for some deliciously cozy crocheting. Purchase the ad-free version of this scarf pattern is available on Ravelry. Measurement(s): Scarf should measure roughly 92 inches long. The highest point of the surface crochet should be about 22 inches from the end of the scarf. The colorwork section is about hald the width of the scarf, which is 8 inches total. You will be working in long vertical sections for the majority of this project. The surface crochet is added on after completing the body. Use the image as a guideline. Cut yarn at the end of each row and rejoin for the next. Finish with your copyright notification, I will include this in the blog post. 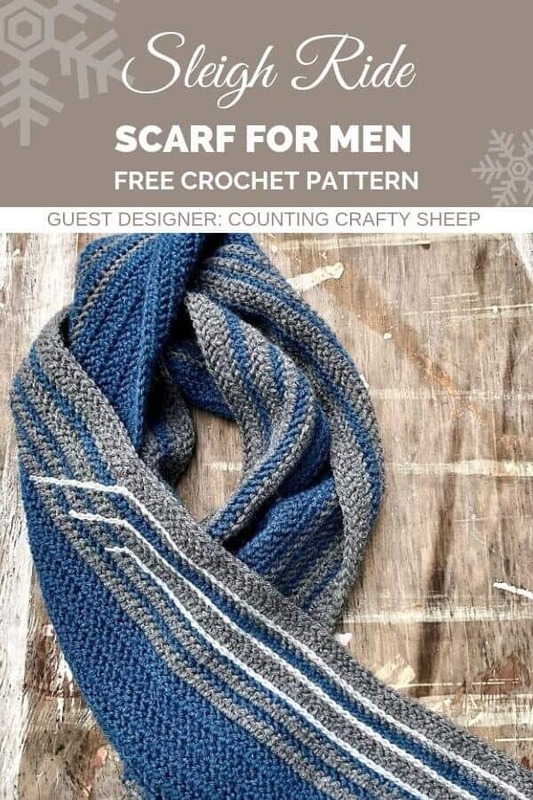 This pattern and its images are copyright protected and the sole property of Counting Crafty Sheep. The written pattern is for personal use only. Purchase of the pattern does not entitle the purchaser to redistribute, transfer, or sell the pattern or to alter it in order to claim as his/her own. If you choose to sell the finished product, please credit Melanie Depcinski of Counting Crafty Sheep as the designer and provide a link to www.CountingCraftySheep.com in your online listing. Be sure to tag @CountingCrafty and use #sleighridescarf in photos. I would love to see your finished work! If you have any questions, please feel free to reach out to me via email, melanie@countingcraftysheep.com. I know you’re going to love making the Sleigh Ride Scarf and maybe even the matching beanie. I so look forward to seeing your finished product. Melanie Depcinski of Counting Crafty Sheep is an emerging fiber artist focusing on using crochet, knitting, and spinning to build personal confidence and a sense of community in the Lehigh Valley of Eastern Pennsylvania. After having her daughter, she stopped working full time and started her own business. As her daughter naps, she takes time to create; counting stitches while her little one is counting sheep. Melanie’s goal is to establish a space where aspiring and veteran fiber artists and crafters can gather, learn, and support one another. Look for her in the Craft Yarn Council video series “Humans That Yarn” and be sure to join the conversation about what being a “yarnist” means to you with #humansthatyarn. Don’t misplace this pattern! Save it to your favorite Pinterest crochet board to make it later.